The phrase “not a sparrow falls” has been considered a beautiful piece of scripture, and an uplifting hymn. It can now also be thought of as a wonderful and compelling novel. Linda Nichols is a gentle story teller. She whispers to us about the power of prayer. She nudges our hearts to be careful of the way we judge those whom we consider have nothing to contribute. She urges us to beware of putting those in spiritual authority on pedestals. She reminds us of the beauty and the importance of being real. This is an experience that you don’t want to miss! Come let us journey together to the quaint city of Alexandria, Virginia. I would like to introduce the much revered and celebrated pastor and host of a very popular radio ministry, Alasdair Macpherson: a man who has lost his wife to suicide and who has locked away his emotions. He has nothing to give and as a result, his grieving children are twice bereaved. Enter Mary Bridget Washburn. As a teen, her mother dies and her father is an alcoholic and abusive. He deserts the family. Welfare takes the younger kids and at eighteen, Mary Bridget is alone. She runs off with a friend who gets into drugs. Soon she’s part of an outfit that manufactures drugs. She lives like this for seven years. However, she cannot shake her spiritual heritage. Her elderly and pain-wracked grandmother, who is still alive and who prays for her, remembered admonishments from her mother and many scripture verses that she memorized as a child are playing in her mind. She finally decides to leave her once-upon-a-time friends. She takes their money and runs away. She then changes her identity and takes on the name and character of her mother. Welcome Bridie! It is not easy to start a new life on your own. But this is what she slowly accomplishes. Her only fear is that one day her former friends will track her down. Nichols brings these two characters together as well as a wonderful cast of supporting characters. The novel is rich with the power of God and the faithfulness of His promises. The humble things in life, cooking, decorating, and looking for daycare are all used to create the presence of Love and thus of God himself in our everyday lives. Potty training, cuddling, and apple pie all help to shape the coziness and importance of our home and our families. It deliberately, yet gently, reminds us that there is nothing in our lives that is too small to be brought before our Loving Heavenly Father. Get on Board – this novel is really worth the ride. Your heart will soar as you visit Alexandria, Virginia, and those who live there. Linda Nichols, I strongly encourage you to consider creating a series wrapped around this characters in this town. 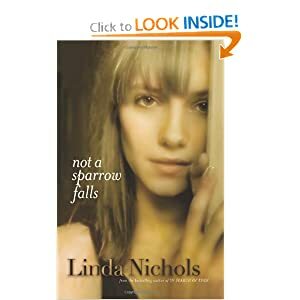 Not A Sparrow Falls is the first novel I have read by author, Linda Nichols. I really enjoyed this modern day “nanny and widowed father” love story. As popular as the classic love story is, this one does not pale or lack anything in comparison to others in the category. In fact, I found it quite lovely, interesting, and sensitive in its presentation of a young woman seeking a fresh start on life and unexpectedly finding herself in a situation like she has always dreamed of with an attractive man and delightful children she can love. Young Mary Bridget Washburn is caught in a horrible life style of making and selling drugs. When opportunity arises, she steals the money from the drug operation and makes a run for freedom. Unfortunately, her ill-gotten money is stolen and she is left with no money and an irrate (and mentally ill) druggie after her for his money and revenge. Not knowing where else to go, Mary Bridget ends up in a quaint small town church seeking shelter and solace for her mixed up life. Wanting to protect herself from her druggie past, she takes on the identity of her deceased mother and sets to making her own life. However, drawn to the pleas of a distressed young girl and being in the right place at the right time, Bridie (Mary Bridget’s nickname) finds herself with the opportunity to love and care for adorable 2 year old twins and the afore-mentioned young girl. What she doesn’t take into account is the attraction and love that grows in her for their grief ridden father, nor the confrontations she will have to make with his two unyielding sisters who are accustomed to controlling his life. As she seeks to bring some brightness and love back into their lives, she herself is drawn to her loving Father and questions her commitment she made to Him years ago when she was a young girl at her grandmother’s knee. Will her new found relationship with God help her and protect her as her old enemy gets closer to finding her and threatens to destroy all her newfound happiness? This novel takes the daydream idea of escaping from unpleasant circumstances and taking on the identity of someone else (even to the point that she tries to think of how her mother and her grandmother would respond if they were in a similar situation,) and living the life until it all comes crashing down around – as it always does eventually. It is based on the Biblical truth that “the truth will set you free” and applies it in a couple ways. First, the Biblical truth of accepting forgiveness and salvation from Jesus sets Bridie free from the bondages of her sin before God. Secondly, the truth sets her free from having to hide her past from those she loves and fearing that she will be found out at any moment. I thoroughly enjoyed this story and was intrigued by the interesting contrast between good and evil, light and dark throughout the story line. The author had a real knack with portraying the drug side of the story and I imagine she must have done some research in this area to be able to present it in such a real and believable manner. I appreciated how the book began with Bridie still in the drug world and seeking an escape and then ended up with the unstable Jonah of the drug world seeking to bring her back. I thought the struggles that all of the characters had were very realistic, even the struggle of the one extremely unyielding sister, Winnifred. I understood some of the Pastor’s struggles with his church and board of leaders and his lack of enthusiasm and fatigue with his church. I appreciated Lorna’s devotion to her brother and his kids and her feelings about her failed marriage. I could understand and empathize with the young girl and her feelings of being left alone without her mother. All of the characters were colourful, genuine, and interesting and easy to empathize with although some more than others, admittedly. Although the fact that some were easy to dislike is a credit to the author as well. I really enjoyed this story, the plot line, characters, Biblical theme, the suspense of whether she would be caught in the end and killed, and the lovely love story between the Pastor and Bridie. I would certainly recommend this novel to anyone who enjoys great Christian fiction!